Large tape measure. Either 100' or 300'. Magnets. I use the round type with a hook an affixed to it. Check north-south orientation, look for bench marks to establish elevation and coordinates. Look over the drawings you brought to see how close the drawings are to what is actually on site. Review the flow sheets to see if the unit or equipment are in process order and instrumentation is places correctly. Determine where you need to concentration your as-build attention. Ready to start sketching, set up your sketch. At the top of the page, write down the client, location, date, your initials, and page number. You can write in project numbers and other identify information later. Place an orientation arrow, north arrow, relative to where is will relate to you sketch. Sketch out the piping, make sure that you capture all the fittings, valves, drains and vents, spectacle blinds or restriction orifices between flanged, etc. that will be in the sketch. Locate all supports, pipe shoes, dummy legs, base supports, etc.. 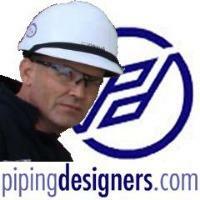 Sketch any close structures, equipment, or objects that might help you locate the piping you sketched to the existing site plans. For dimensioning, I like to use several methods. If I have a line of fittings and valves, I usually verify that they are true to fitting dimensions and if they are, I write down "FM" (for fitting makeup) on the sketch. Remember to check the raise face on the flanged and the gasket thickness. If you have piping with pup, or straight piping on it, there are two ways to dimension. One is to measure the pup from weld to weld, and add in the fittings later. Second, you can measure from fitting to fitting centerline by estimating the center of the pipe or fitting on each end. Measure from the top of concrete (TOC) to centerline of pipe to top of support (TOSPT) if there is insulation shoe under the pipe, make sure to note it. If piping is offset from concrete or structures, slip a length of twine to the bottom of the pipe and stretch over to the nearest concrete or structure. Level the line with a line level will raising or lowering the twine against your tape measure..
For finding elevation of piping overhead on supports, one way is to stretch your small tape up the side of a support till you can hook to the TOS. Now you can either stretch the tape out so you can bend it at TOC to see your elevation, or, you can premarked a line on the column and measure to it.